Let me tell you guys, given that our family session was first scheduled for August 25th, I've had quite a bit of time to mull over our outfits. Toss in a bit of apprehension knowing we'd be doing some promotion shots for my site and uncertainty over the weather conditions and I probably had 5-6 outfits I was tossing about in my mind. This one though? This one was solid. I thought we looked like a million bucks, but wanted to share with you just how far from that this family outfit actually cost. It just blows my mind that the final dollar amounted to $79. Tony: Blazer, shirt, tie, jeans shoes. Leah: Undershirt, tights and boots. Isaac: Shirt*, vest,* socks and jeans. Tony: Merona Sweater from Target. Leah: Dress from Burlington Coat Factory Warehouse in WSP + Target Cardi on TPC. *My Mom purchased in Florida while I was still pregnant with Isaac. 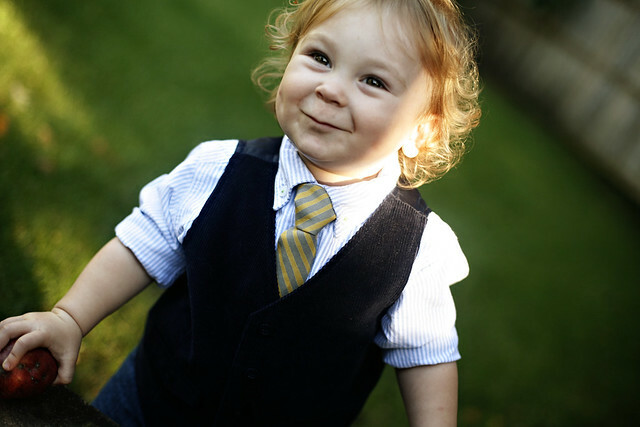 The Carter's shirt was $7 and the Gap vest was $4.97! Incredible. My absolutely favorite purchase was Isaac's little tie. The wonders of Etsy never cease and I bought through Babybystevie's shop! I know how much anxiety planning outfits can cause, so I just wanted to put it out there that you should start with what you all ready own. 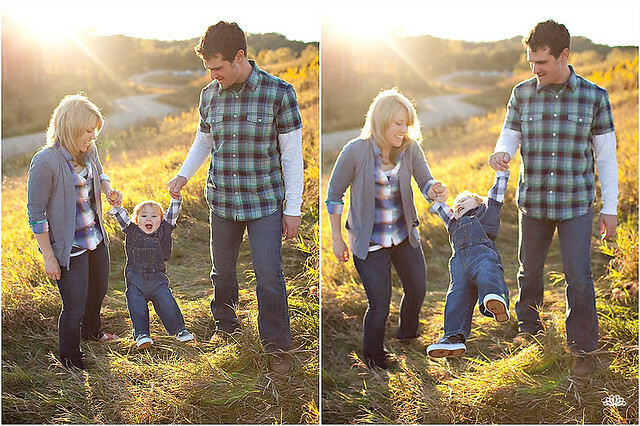 Figure out the style of the photos you want, either dressy or casual and go from there! You'd be amazed at what you can pull together with limited embellishment and additional money spent. That said, I know half the fun can be shopping for the new clothes! My husband's hot. My boy never fails to make me smile. 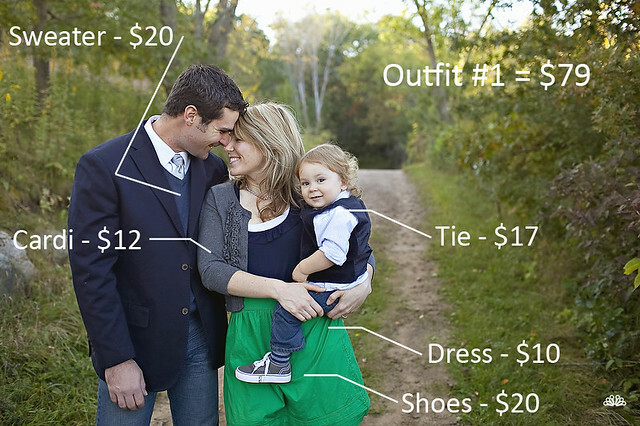 All too often I think most people tend to simplify their clothing choices for family photos. While there is certainly nothing wrong with this, the pictures can be a little dull. Ideally at least one print or pattern can be interspersed with pops of contrasting colors. This adds variety and movement to the image. It is a delicate balance between the three though of too simple - just right - gharish. And that's not to say that I think I nailed it with our choices. I almost think that our outfits were just a little safe and wish there had been an additional pop of color. I had to laugh when I told Gina about our 2nd look though. By describing it as all of us wearing plaid, I'm sure she expected the worst! I believe that these plaids go together smoothly without being crazy on the eyes due to the ample amount of solid color. By wearing my cardigan over my plaid, putting a polo over Isaac's and showing long sleeves with Tony's plaid I allowed the eye to rest. This look was a bit more than the first mainly because we purchased the trendy plaid. To the dollar this second family outfit was $100. I just want to encourage those of you who have fall sessions coming up yet to go a little bit out of your comfort zone. Consult with your photographer as well! When choosing a location you should be in cahoots to determine the look you want to achieve. Due to this, they should be a great option to bounce outfit ideas off of. They should want to help you with this as well, else they could be stuck with boring or zany! 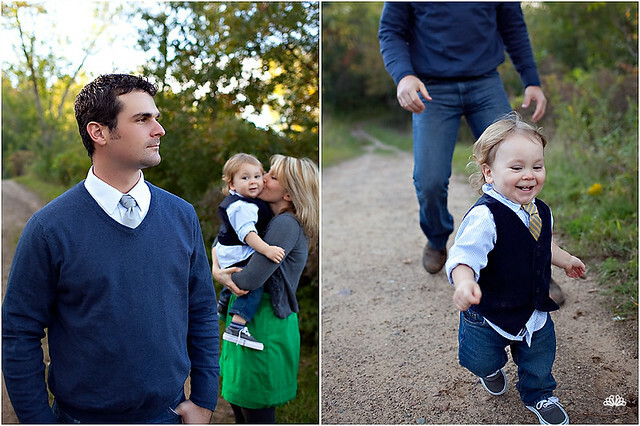 :) I've gotten extremely lucky this fall with fantastic clients who've paired their family outfits together so well! Some have consulted me and I've loved knowing that they respected my opinion. you more-than-pulled-it-off! you guys look awesome! thank you so much for this post... so helpful! now i just wish i had some talented photographer friends... or more $ to get some amazing photos like this done! You guys look awesome! I love your plaid top - where did you get it? Thank you SO much for this post! We have our pictures coming up in November, I hope! I love ALL of the outfits! Too cute!! Can I tell you how many times I have *almost* purchased that cardi from Target?! I just haven't yet because I'm not sure I like where it hits on my giraffe-self! Anyway, I think you nailed how to wear patterns without it looking too crazy! I love this break down and I love that you got such great outfits for so little! What a great deal! And you guys look awesome! As far as the plaid outfit, I think that it turned out great! Your family looks so good together! The photos are amazing!!! For some reason all the photos come up as black, BUT from other comments it sounds like you guys look FABULOUS! So what you're saying is that you want to be my personal shopper, right? Great.